Immediately following the attacks of 9/11, nearly 100 trained search dogs and their handlers—enlisted from 18 U.S. states—were deployed by FEMA to join the rescue efforts at the World Trade Center in New York and the Pentagon in Washington, D.C. Though all the heroic 9/11 dogs have since passed, their memory is still with us today. Seeing images of the dogs working tirelessly around the clock to locate survivors in the rubble alongside firemen and other teams sorting through the debris, showed us just how brave dogs really can be. These same images deeply intrigued Dutch photographer Charlotte Dumas as the events unfolded in the news media. One decade after 9/11, discovering that only 15 of these dogs were still alive, Dumas succeeded in tracking each of them down, traveling across nine states in the U.S. from Texas to Maryland. Dumas captured the remaining dogs living out their twilight years in their homes where they lived with their handlers, a full decade on from 9/11. Composed at close range in natural light, Dumas’ powerful portraits offered an intimate view into the everyday lives of these highly specialized working animals, sharing the vulnerability of old age as they once pursued a common heroic goal. 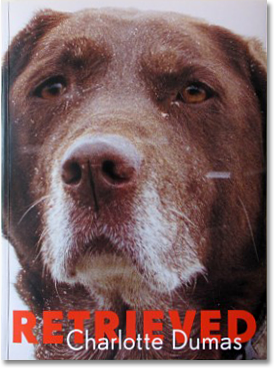 Dumas’ book was released seven years ago, but just like the images from 9/11, her follow up with the canine heroes reminds us of the truly amazing accomplishments of these pups. This article has been updated from its original version published on 9/11/11.